Other: First book in the Immortals series. The sixth and final book, Everlasting will be published on June 7th, 2011. Ever has lost her parents, sister and dog in a horrible car accident. She was saved, but ever since the accident, she can see auras, hear thoughts of others and see ghosts. It drives her insane and she tries to block everything out by wearing hoodies and listening to loud music on her iPod to block out the sound. Until Damen comes along. Damen mutes all the sounds around her and can even make things appear and disappear without explanation. Of course, it turns out that there's more to him than just good looks and wealthyness. I've had this series for a couple of months now and even though I picked it up because I liked the synopsis, I wasn't tempted to pick it up any time soon. I'm glad that I did though, because it turned out to be an enjoyable read. There's not too much going on in this book in my opinion, just the finding out of who and what, but it was entertaining nontheless. I liked Ever. She shut herself down almost completely because of all the energy in her head and the supernatural things she can see and hear. I can imagine that - it must be like a constant radio going off in your head. She was terribly sad, depressed even, but still she didn't come across as whiny to me. She was no Bella by any means. I had some trouble with Damen, though. First, the name wasn't the best choice in my opinion. It reminded me too much of Damon Salvatore from the Vampire Diaries, and even though that may not have been Noëls intentions, I caught myself thinking of Damon Salvatore several times, while I should be thinking of Damen Auguste. And then there's the whole mystery thing going on. To me, as a reader, it was pret-ty obvious what was going on, as well as what was going on with Haven and Drina, but Ever couldn't make the connection. That felt frustrating because it was so obvious that she should have at least had some thoughts on what was going on. The book is a fun read if you ask me. It had a female protagonist that wasn't a whiny girl sitting around, it had a gorgeous male love interest and Riley. I love Riley. I think she's cute and I'm looking forward to seeing what Noël has in mind for her. Evermore had a villain, that brought some action and tension to the book, even though she didn't strike me as scary or evil. I didn't really feel anything with her. 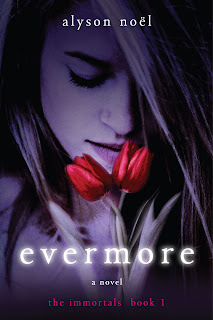 I'm also looking forward to seeing how Ever develops in the next couple of books, since she has a lot on her plate, especially after Evermore. Three and a half stars, because it was an enjoyable and easy read and I'm curious to see what Blue Moon has to offer. I liked this novel as well. It wasn't the best book I've ever read. Great review. They have translated into my language. But I still want to read the English copy.